For the past six months I’ve worked with my long-time collaborator, Nigel Borell to produce a second issue of the free arts publication, SOUTH. We established SOUTH in 2010 as co-editors and launched the first issue in January 2011 at Fresh Gallery Otara. Despite significant changes in budgets, energy and employment, Nigel persisted with the vision and Issue 2 was born. His hard work has attracted investment and financial support from Manukau Institute of Technology (Faculty of Creative Arts) and the Creative Communities Scheme, all of which has enabled me to return to the shared editorial role in a freelance capacity. We’re excited to be working with a new group of stakeholders and look forward to extending the investment opportunities for Issue 3! Nigel and I have a close working relationship with Edgar Melitao, SOUTH’s design partner and artistic director. Choosing a front cover image is a highlight of the design and editorial process; it seems to bring everything together and galvanise the conviction of the publication. I produced an experimental fashion editorial for SOUTH Issue 2 working with local designers Melissa Cole, Genevieve Pini and Tyrone Tautiepa. Shot on location in the South Auckland suburbs of Otara, Middlemore and Papatoetoe, the designers were challenged to research and develop, style and direct their own shoots with photographer, Vinesh Kumaran. 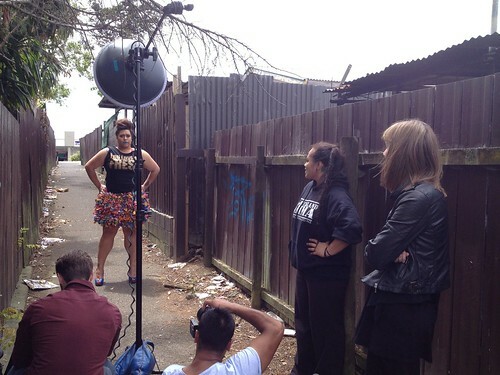 The SOUTH Issue 2 cover shot was styled and art directed by Otara-based Samoan artist and designer, Genevieve Pini. Pairing her own design, the Miss Lavalava skirt (featured in the 2012 Cult Couture fashion award show) with a limited edition chopped & screwed YOU LOVE MY FRESH t-shirt by Tanu Gago (a Mangere-based Samoan artist) she wanted her image to be fierce and empowered, and to represent an homage to her hood. As a cover, this image represents the defiant and robust nature of the South Auckland arts sector: its strength, urbanity, Pacific Island cultural richness and unique vernacular. As a representation of the Pacific Island body, it is empowered, relatively unedited and unapologetically XXL. As the model and producer of this image, I love that it enabled an artist to engineer her own representation. SOUTH is a free annual arts publication published by Toi o Manukau. It is available at art centres and libraries throughout South Auckland and at selected art spaces in the Auckland region. Join SOUTH on Facebook to comment, share and engage with the SOUTH community.